Here's the remote controlled garden lighting unit which I built for my house. It needed to control several lighting channels via a remote keyfob, and preferably include a timer to switch the lights on automatically in the evening etc. I decided to build a controller rather than buy one because 1) it was much cheaper, 2) it was fun and 3) it enabled me to include the timer facility, which wasn't available on any commercial units at reasonable cost. The radio link uses 433MHz AM mode. I did not design the radio link but used commercially available transmitter (keyfob) and receiver modules. The receive antenna is 17cm of stiff wire. 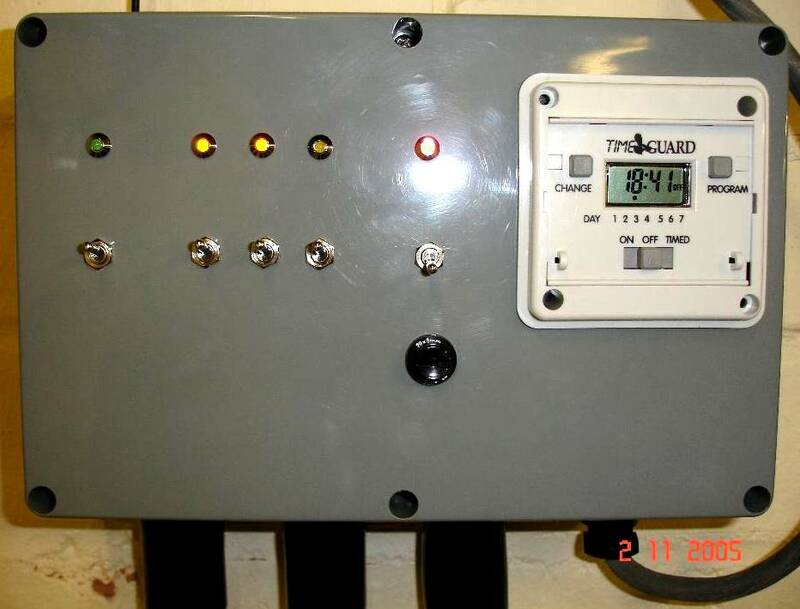 Transmit power is 10mW and the range is said to be 100m in open air. In practice I have found that I can operate the lights from any part of my house and garden, which is enough for me, and much better than can be said for my remote garage door opener keyfob. The receiver module has three logic level outputs, with which I drive three relays via a transistor buffer. A completely standard and straightforward circuit. 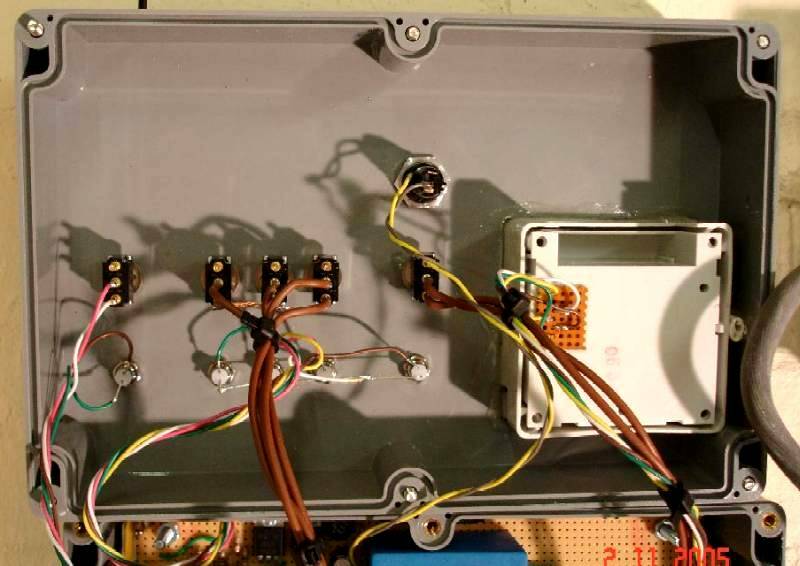 The power supply produces regulated +12V for the relay coils, and +5V for the receiver module. 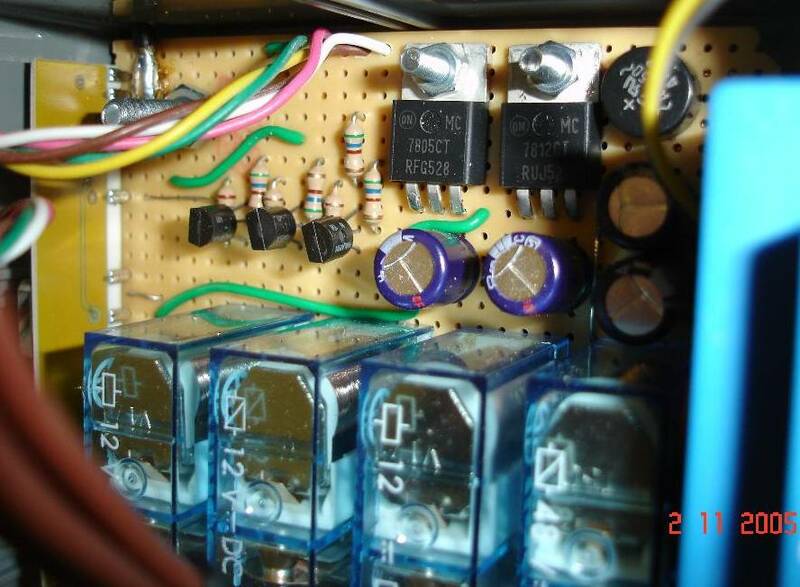 The timer module is powered directly from the mains with resistors and a 47V zener diode. 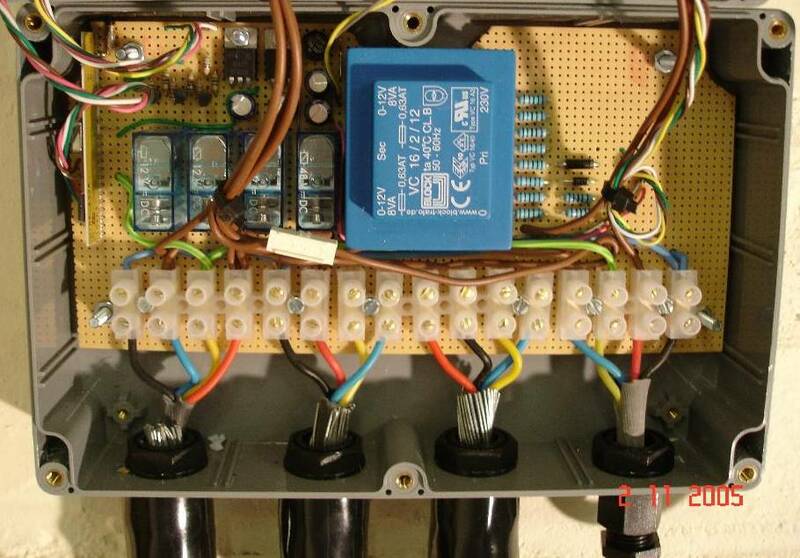 The relay output of the timer is designed to switch a 48V relay. There are five front panel switches. 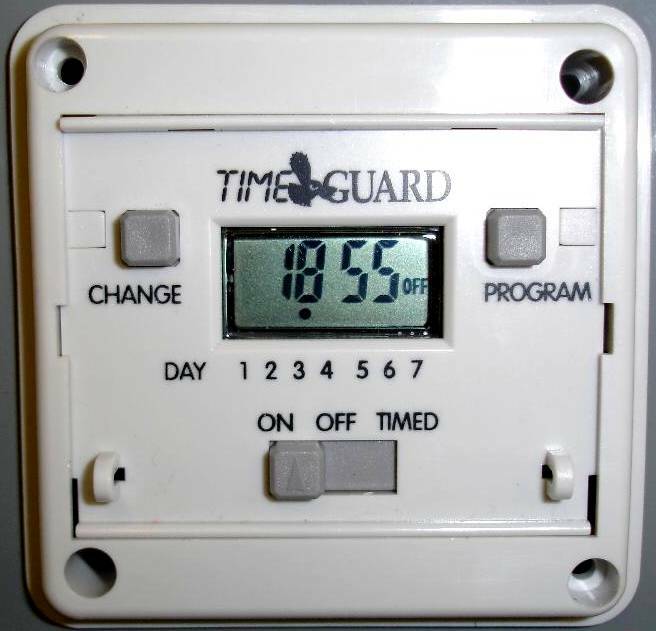 The middle three enable the timer on each channel. There is only one single timer, and when the channel is switched to timer, that channel lights when the timer is ON regardless of keyfob presses. The right hand switch is a master ON/OFF switch. The left hand switch is the programming switch for the receiver, a momentary action switch which causes the receiver module to enter learn mode, for recognition of new keyfobs. Left: The unit is built in a grey plastic box which is screwed to the wall. The LED's indicate the state of the three lighting channels. The red LED on the right is a power ON LED. The green on the left is the receiver status LED. It flashes in time with the LED on the keyfob, when a button is pressed. Middle: Close-up of the 7-day timer moduele. Standard stuff. It has 6 programs, which can be enabled for various combinations of days on the weekly cycle. Right: Construction is on a matrix board having tinned copper islands on the reverse side (not copper strips, which I dislike intensively). No attempt was made to miniaturise the construction. It was intended to be easy to build, reliable and work first time (which it did). External armoured cable connections are via terminal blocks. The wiring on the upper side of these blocks determines which lighting cables are assigned to which of the three channels. Left: Here you see the switch, LED and timer installations. Middle: This view of the circuit board shows the voltage regulators, transistor buffers and relays. The receiver module is mounted perpendicular to the board on the far left of this photograph. This location was chosen such that the antenna pin was right near the top left corner of the box. The antenna wire would then be as far as possible from the house wiring when the box was screwed to the wall. 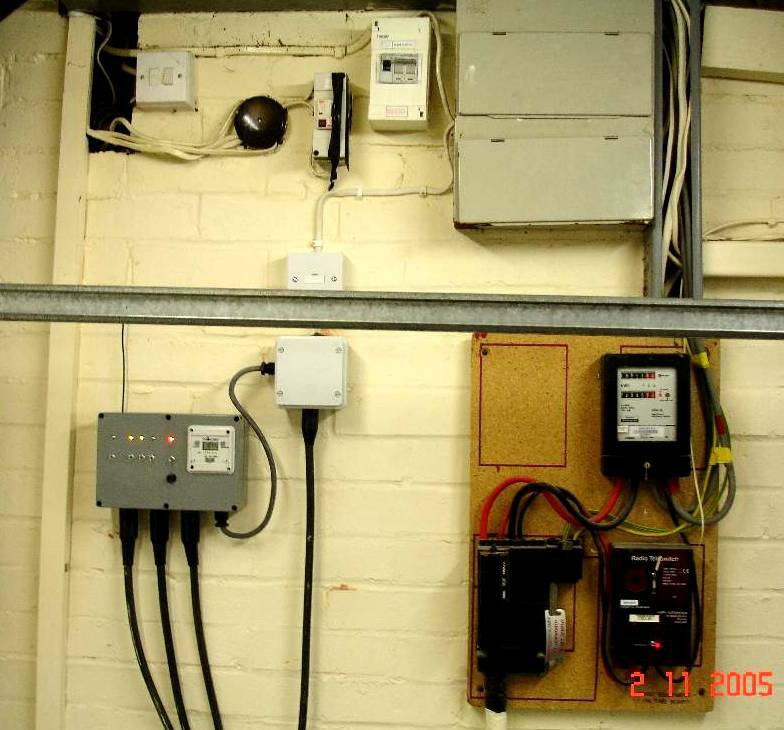 Right: The lighting controller is fixed to the wall next to the other electrical equipment (fuse distribution box, electricity meter, etc). Four armoured cables (each 4 x 1.5mm core) lead off to various parts of the garden. The metal bar across the centre of the picture is part of the garage door opening mechanism. The fourth (right hand) armoured cable has a separate small white junction box, because it also powers the electric gates, which were a prior installation.